On a day that should have been marked for celebration, Alex Sullivan's friends and family hadn't been able to reach him. The married bartender celebrated his 27th birthday by attending the midnight screening of "The Dark Knight Rises" in Aurora, Colo., with his co-workers. A family friend has now confirmed that Alex Sullivan is among the people who died in the theater shortly after midnight, allegedly at the hands of suspect James Holmes. Sullivan's phone was off, and his car was still parked in the lot at the Century 16 theater in Aurora. He was not one of the injured being treated at local hospitals. "There is a reason why he has not responded," Bryan Beard, who has been friends with Sullivan since their freshman year in high school, said earlier in the day. Beard had been camped out at Gateway High School, where witnesses were taken after the attack, waiting for information about Sullivan. 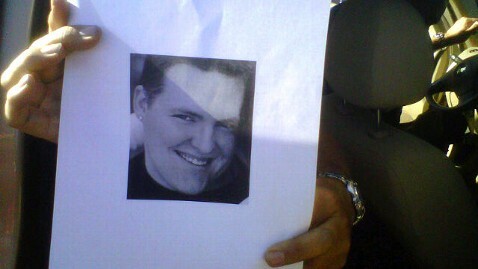 He was joined by his friend's father, Tom Sullivan, who carried a photo of his son, hoping someone would recognize him. Shelly Fradkin, who is Beard's mother, said Aurora Police were supportive in communicating what they could to friends and family members. "They have really gone above and beyond," she said earlier in the day. "We have turned over every stone we possibly could today."